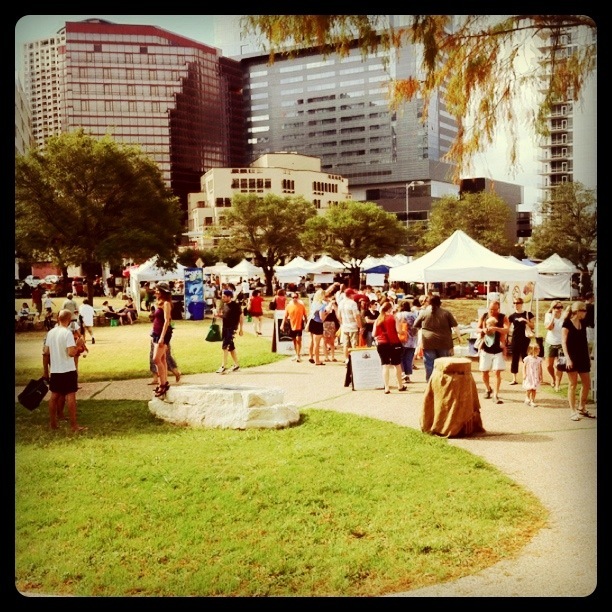 Every Saturday from 9am to 1pm, Republic Square Park (on 4th and Guadalupe) is host to the Sustainable Food Center (SFC), Farmers’ Market. The market first opened May 3, 2003 and has since grown to be in the top 10% of markets. The market features fresh local, in season produce and wares from local artists and businesses. The SFC aims to “1. Increase the economic vitality of local farms and small businesses; 2. increase awareness, knowledge and action among the Central Texas population about how to positively impact the Central Texas food system and their own health; and 3. create vibrant economically and socially diverse city-centered gathering places.” In a recent survey taken at the Farmers’ Market, the SFC found that 68% of the attendees go to the market to purchase fresh fruits and vegetables and 52% of the attendees go to support local farms and businesses.